A friend in California told me this morning that he dreamt of her last night. That is no more ludicrous than my vision of Jonathan…how do I separate the sweet Momma from the powerful saint? Is there any real distinction? I feel guilty for leaving the temple before her funeral, several of my friends are keeping watch all night. I adore Enriqueta, I am devoted to Enriqueta. Even if it had not been for the Vision of Jonathan and the resulting birth of my son Leo, I would adore her, and follow her teachings as so many others do, but I would not feel the need to submit myself to her or to SMI with SMI there is no sense of the need to submit oneself to the group. Santa Muerte Internacional is an open door, come and go as you choose. Devotion is by choice, not group directive. Yet all my words fall flat and seem hollow in light of who she was what she represented, the magnitude of the loss the entirety of the SMI family is feeling right now and spiritual intersession she is now capable of.. I tried to be polite and represent SMI as Momma would expect me to – with dignity and humility… In a way reminded me of Glenna’s burial, we put my mother in the ground and went straight to the greenhouse and began loading plants for the route the next day. Life goes on, even when we are shattered.. I have not wept with a loved one for a lost loved one as I did today since Glenna passed. I am in humble devotion to our Santa Muerte y Pantera, my faith is with thee Madrina Enriqueta Vargas. I am little more than a plow breaking the fallow ground in the U.S., preparing the soil to receive the seed of those who much wiser and greater than I. My relationship to Pantera, and now Madrina Vargas, is twofold. They stand as a powerful saintly figures that have permeated every aspect of my daily life, efficacious miracle workers, a paradox hidden within mysteries, figures of redemption, for lack of a better term, messianic Saints that have transformed my life. But there is also the human aspect, when I contemplate Jonathan, I see him through the eyes of a parent, I understand how much love and devotion you feel for your son Momma Vargas, our powerful Saint shall always be your little son toddling across the room taking his first steps, your ears will always recall the first time he spoke the words “momma” .. I am a servant, and a slave unto mi Padrino y Madrina, they have taken a broken empty vessel and made it whole once more, and filled this empty vessel with the waters of holiness. The world is not waiting for a new definition of Christianity, it is waiting for a new demonstration of faith, hope and charity under the tutelage of love. 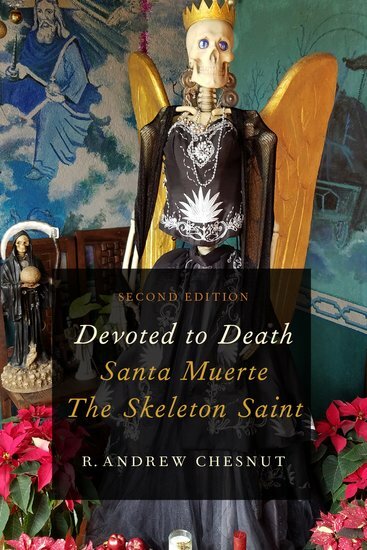 I was an atheist when I first heard the call of Santa Muerte in Ciudad Juarez. As I kneel before you in this hour, I know that an almighty God has prepared the path and brought me to SMI. I am a simple and humble man, I am an evangelist for Santa Muerte International.